I've become many things in the world of virtual reality. One time I became a skydiver, another time I was a World War II soldier — hell, I've even been Batman, on occasion. But through all the trips and experiences I've made when wearing a headset, and all the different ways I've been immersed, I've never truly experienced art through the platform. And so, since launching late last year and making its way into the Tate's Modigliani exhibition and From Life in the Royal Academy of Arts, I've found the Vive Arts project an intriguing one. And for its latest work in the area, it's trying out something new — working with artists directly in order to create contemporary art. Instead of a recreation, Vive has instead collaborated with two artists, Marina Abramović and Anish Kapoor, for two new, very different pieces of VR art, with both set to be opened up to the public from 29-31 March at Art Basel in Hong Kong. "Sometimes artists will have an understanding of the technology, but they often don't know exactly how far they can push," Vicky Chang, director of Vive Arts, told us. "Artists are an extremely interesting group of people to work with, because of their curiosity; they always want to do something radical and something challenging. If you're a gaming developer, you maybe stay more within a box." And as I went up the stairs of the Royal Academy, through the dimly-lit corridor and into the famous Reynolds Room, yes Darwin's On the Origin of Species Reynolds Room, I was about to find out just how out of the box Kapoor and Abramović drifted. And also, along the way, just how far art has progressed since the paintings surrounding the HTC Vive Pro setups were first produced. The first was performance artist Abramović's Rising, a piece which focuses on climate change. When first dropped into the experience, I'm met by a slightly haunting avatar of the artist herself floating in a glass box filled with water. The Vive Pro's controllers allow me to reach out and touch the glass box, and I'm also given control over whether the water in the vitrine continues to rise or fall. Abramović's avatar invites you to reach out and meet hers through the glass - do nothing and the avatar effectively drowns, but pledge to help the planet and the water falls. I did the right thing, you'll be glad to know, reaching out to meet the avatar's hand, as a vibration in the controller then joins a cut into white light. As this breaks off, I then find myself now in a fierce storm near an glacier. Slowly, as I look around to the crashing waves and hear the winds swirling, the iceberg breaks up and the headset cuts to black. 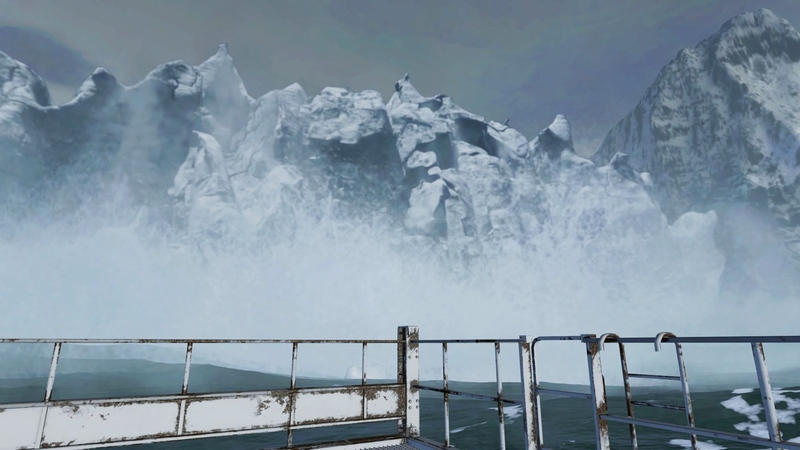 The quality shown in front of you may not be the best you're likely to experience in VR - the ice shelf, for example, is quite blurry - but the audio is excellently fed through the Vive Pro. If you don't necessarily feel immersed through your eyes, the sound certainly makes up for it. "It's all a work in progress, and it's far from finished," Abramović stressed. "Technology within VR is becoming more sophisticated every week, but what I find fascinating is that this makes it possible for you to exist even when you're not here anymore." In contrast, Kapoor indicates that the idea of using the platform to extend a legacy didn't bear heavily, if at all, on his piece. And this is perhaps surprising, given that Into Yourself - Fall provides a literal (but, you know, actually still figurative) dive inside the human self. In his piece, users begin in a wood, surrounded by trees and a blowing wind, before the ground breaks up beneath, giving you the same sensation of dropping on a rollercoaster, or falling in a dream. What follows from the vertiginous beginning is a six or seven minute spiral through the human body, with the trees replaced by gory insides and hollow sounds. And interestingly, producing this kind of journey is something that Kapoor, a sculptor, notes that he struggled to do for the platform. "VR is a strange medium because all sequential processes aren't necessarily narrative. Vertigo is something that VR does more than any other, and I thought this was the way to capture somebody," said Kapoor. "It's visceral, it's three-dimensional and you're fully present within the experience. I'm a sculptor, and I make objects, and I'm interested primarily in the body — interiority, vertigo, falling into yourself, it felt obvious from there. "But I've always found narrative a real problem. A sculptor, in a way, looks for an enduring condition — it's a condition of matter, of colour. But filming is necessarily narrative, you can't avoid it," he continued. This speaks to the wider challenge for more traditional artists discovering the platform for the first time, such as Kapoor. There may be the same inspiration and willing to create something powerful, but this is art with more strings attached. Collaborations with VR studios make this more of a group effort, with Kapoor also noting that Into Yourself - Fall progressed after many conversations with Acute Art, the team involved with both pieces at the Royal Academy, and after the initial images he shared were greatly elaborated. But, as Chang alluded to, this is all fresh for artists. And in this particular project, working directly is also a totally new concept for Vive. So where does it all progress from here? "We do think gradually more artists will want to share things in VR and AR. And we think social experiences will be big. Having more than one person view an experience at the same time, maybe with friends all in different locations, that's exciting to us," she said. So after tapping into virtual recreations and VR experiences that enhance work in the real world, Vive Arts is now helping forge entirely new VR art. And in this case, it does it well. The experiences aren't overworked, but still manage to make strong use of sound to draw the user into the overarching message. And, who knows, if more artists continue to embrace the platform, we could soon be turning up to a museum filled with only headsets. What a world.